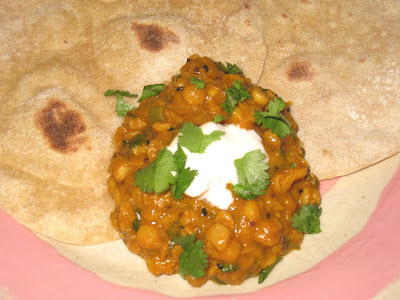 Chana dal is a small dried chickpea that has been peeled and split in two. It is similar in size and appearance to green and yellow split peas, but unlike the green pea it does not turn into mush when cooked, and it has a nuttier taste than the yellow split peas. It cooks faster than the larger European chickpeas and makes a lovely dal, which is how I used it here. If you want to start using more legumes in your diet but find yourself tired of your usual methods of preparing them, dals are a great way to expand your repertoire. If you do not have all of the spices that are required for a recipe, you can easily just use commercially prepared sweet curry powder that is available at the grocery store. That's how I started, then as I started buying more of the individual spices that make up curry powder I started using those in addition to, and then instead of, the store-bought version. If you are going to substitute curry powder, I would suggest that you total the amount of all of the spices, and then round down for the amount of curry powder to use. The amount of spice in a dish is determined so much by personal taste anyway that you should quickly get a feel for how much to use based on how spicy/hot you like your food. The main thing to remember is that in most cases it should be added to the oil and aromatics and cooked for about a minute to get rid of the raw flavor, and to release the oils in the spices. But I still have the store-bought curry powder in my pantry, because sometimes I am in a hurry and have neither the time nor the inclination to use the individual spices. But do take the time to seek out a curry powder that you like. There are many different blends out there, and their freshness depends on how frequently they turn over at the store. I buy my sweet curry powder at The Spice House, where you can find this helpful information about the different kinds and decide which one you want to use. I was also gifted with a container of Madras Tamarind Hot Curry from New World Spices, and it has become one of my favorite blends. I like it especially with the Spiced Tomato and Red Lentil Soup recipe that I posted about here. Like most dals, this one is pairs well with homemade chapati. But if I am not in the mood to make chapatis, it is equally delicious with plain or dill brown rice. Sort through and rinse the chana dal, then soak in 3 cups of water for 2 hours. Drain the soaked beans. Bring the 3 cups of broth plus the cup of water to a boil. Add the chana dal and lower the heat to a simmer. Cook for 30 to 40 minutes, until tender. Add more water if needed. Combine the oil and nigella seeds in a large skillet and turn the heat on to medium high. Once the seeds are sizzling, add the cumin and mustard seeds and let them sit for about 30 seconds, until the mustard seeds start to pop. Add the onions and cook for a few minutes until they are translucent, then add the garlic, ginger and serrano. Cook for another 6 to 8 minutes, until the onions are well softened. Add the tomato paste and cook, stirring frequently, for about 3 minutes, until the tomato paste has started to darken. Add the cumin, turmeric, coriander and paprika and cook for another minute to release the oils and fragrances from the spices. Add the cooked chana dal with any remaining liquid and combine. Mix well. Season to taste with salt and pepper. If it is too thick, add water. Cook for another minute or two to let the flavors blend. Add the yoghurt and cilantro, stir, and remove from the heat. Serve immediately, garnished with a dollop of yogurt and cilantro leaves. Hi Inessa. Happy New Year to you and your family! If you do try it, I hope you will let me know how it turns out! I get the chana dal at an Indian grocery store on Devon Avenue here in Chicago. I haven't looked for it at Whole Foods but I guess I'm not too surprised you didn't find it there, although Bob's Red Mill has it and WF does carry some of their products. If you don't have access to an Indian grocer, you can get it online. You could use yellow split peas, but I think it is worth the effort to track down the chana dal. The curry powder could replace all of the spices - the nigella, cumin and mustard seeds and the ground cumin, turmeric, coriander and paprika. However, it doesn't have to replace all of it. If you had the cumin and paprika, you could use those plus a teaspoon of the curry powder. If you were only using the curry powder, I would say 2 teaspoons would be a good start. Just add it to the onion and tomato paste where you would have added the ground cumin, turmeric, coriander and paprika and cook it for a minute before you add the chana dal.